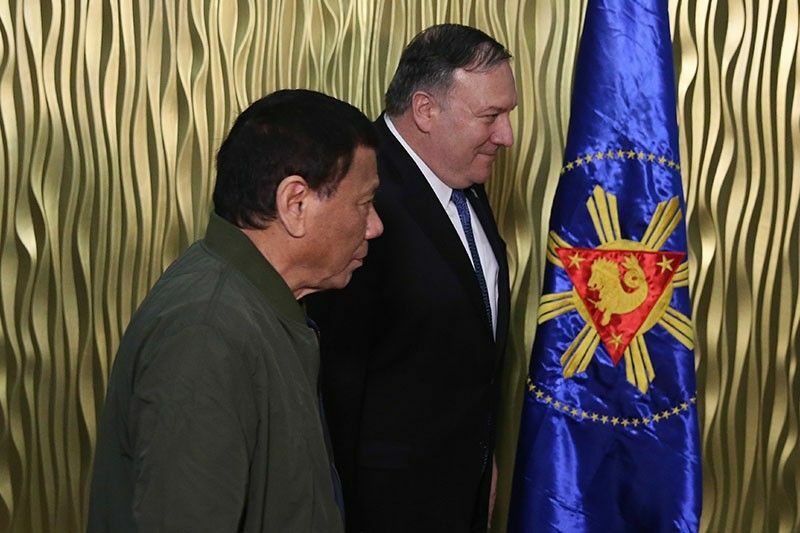 President Rodrigo Duterte and US State Secretary Mike Pompeo during the courtesy call at the Kalayaan Lounge, Villamor Air Base in Pasay City on Feb. 28, 2019. MANILA, Philippines — Despite calls to review the 1951 Mutual Defense Treaty (MDT) between the Philippines and the United States, there have been no requests from either side to do so. Patrick Murphy, US Department of State Principal Deputy Assistant Secretary for Southeast Asia, said the two countries have been regularly discussing the treaty. "There is no request from either side to renegotiate the treaty. That said, we have frequent discussions and talks in appropriate channels with appropriate mechanisms on a regular basis about the treaty," Murphy said in a telephone press briefing. Both countries remain open, if there is mutual agreement, that the treaty needs adjustments of further clarification. Murphy stressed that the decades-old treaty continues to serve its purpose of mutual defense for the two allies. "I think I will leave it there. There are many voices in the Philippines these days who are making observations about the treaty, but I share with you the official view that there’s no request to renegotiate, and there’s appreciation for the clarifications that have been shared," Murphy said. During US Secretary of State Michael Pompeo's visit to the Philippines earlier this month, he assured Foreign Affairs Secretary Teodoro Locsin Jr. that the MDT covers the South China Sea. The top American diplomat pointed out that China's military in the South China Sea threatens the country's sovereignty, security and economic livelihood. "As the South China Sea is part of the Pacific, any armed attack on Philippine forces, aircraft or public vessels in the South China Sea would trigger mutual defense obligations under Article 4 of our Mutual Defense Treaty," Pompeo said. Locsin, meanwhile, said there was no need to review the treaty as Washington's assurances to assist the country was enough. "I don't believe that going down into the details is the way the sincerity of the American commitment will be shown," Locsin said. Following Locsin's pronouncements, Defense Secretary Delfin Lorenzana stood firm on his position that provisions of the MDT need a review. Lorenzana pointed out that the current security situation in the region has change since the treaty was signed in 1951. "I do not believe that ambiguity or vagueness of the Philippine-US Mutual Defense Treaty will serve as a deterrent. In fact, it will cause confusion and chaos during a crisis," Lorenzana earlier said.